The Making Of "When The Lightning Crashes In"Where do you begin? Well I guess with the guitar and a song idea and the machine is in swing. I am posting this new video to show one of the many ways in which a song is conceived, recorded, and then the clock starts to get it to a tangilbe, hold in your hand CD. This Blog is a great way for you and I to watch as the process unfolds. I’ve never been able to have this communication with you this regularly and quickly, and I’m lovin’ that! So I am, oh no here it comes….announcing…(by the power of God) that my release date is November 2012. There I said it. So the attached video is one of many coming that will give you up close glimpses into the entire process. There will be some videos with vocals, some without. So enjoy the latest, leave comments, and thanks for listening. Here, let me stick this in your face, oh maybe two feet away, start videoing you and then you can record your best guitar take ever! No pressure, c’mon Man, kill it! Well, it’s been awhile since I’ve had that scenario, “Red Light-itis”. When the little red light comes on and you have to have an out of body experience to record your best take. All went well yesterday recording “When The Lightning Crashes In” acoustic guitar parts, as a matter of fact I got them both in one pass, so I guess the place I went in my out of body experience must’ve been pretty cool. Of this I am thankful! There you have it, one of the many adventures in recording my CD. 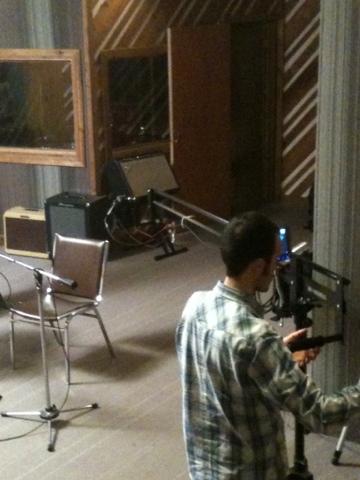 The attached picture is Barrett of Cabin 14 Films setting up for my video. I will be posting that vid as soon as editing is done. Onward and upward!